A "workbook" so to speak about finding the purpose at whatever point you are at in your life. Inspiring! Great book to read at the point of turning 30. Gave me a perspective on where to direct my life moving forward. 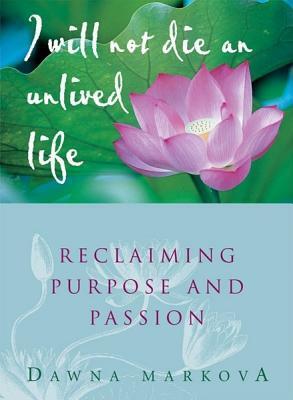 A nice range of insights and nuggets of wisdom related to finding personal balance and reclaiming your passion/purpose.I read the book during a period of personal inertia and apathy, when I have been struggling to find energy and meaning. I found it very helpful to reconceptualize this period as passion's rest, for example. Not a malfunction or dis-ease, but a healthy function for a living organism.Markova's discussion of constellations ~ as a metaphor for how we navigate through discerning our purpose ~ was also insightful for me. As a person who has long enjoyed breathtaking glimpses and world-reordering awe of the night sky, this image is a powerful one for me.That said, I found myself resisting this author and her approach at times.First, very few of us enjoy the luxury of a 6-month sabbatical for absolute solitude to restore and rebalance ourselves. Most of us will not have a private audience with the Dalai Lama (even a cancelled one) or walk on the beach with Thich Nhat Hanh and 1000 disciples. I guess some of her stories, tho poignant and personal, were too lofty and remote to feel relevant for me.Second, I flinched at one encounter where she spoke of sharing with a man who was really struggling a story about a Santa Rosa church and its disfigured statue of Jesus. After recounting the story, she seemed to acknowledge that she had never heard of Santa Rosa and knows nothing of the Jesus figure from the story. Did she make up a fantasy story for this struggling man? If so, it smacks of stark inauthenticity. And at the very least, it left me wondering whether other stories recounted in the book were likewise imaginative figments.Finally, the occasional nod to the distinction between purposeful living and remunerative work was too slight, in my opinion. Maybe that's because it's part of my own struggle. Possibly most of her readers have the range of career choices that enable them to reinvent themselves as purpose and passion evolve. But not everyone enjoys that luxury. I wish she had explored this more extensively.Even so, I give this book three stars because I do think there are nuggets that many people would find helpful and worth the effort to discover. "It is not the events in our lives that determine who we become, but the meaning we choose to place on those events." - Victor FranklI have read this book three times, and I always walk away both centered and inspired. One woman's simple exploration of what her life means, Markova experiences it all; trials, joys, the bitter with the sweet, and shares her journey to living a life of passion and purpose. I found it inspiring and, in a weird way, calming. It was a reminder that I can have exactly what I want out of life, and to slow down and appreciate what I have. She designs an acronym for LIVE to guide her when she is at a crossroads in life:L: What do I love?I: What are my inner gifts and talents?V: What do I value?E: What are the environments that bring out the best in me?In doing so, she stays true to her personal path. Part self-help, part memoir, Markova lays her soul bare for the reader, and reminds you to look at the good and move towards the life you want. Understanding and seeing our life as nature's natural cycle of spring, summer, fall, winter. How do I live in a way that brings out the best of who I am? This book made me think and search deep down inside of myself to find what I want to change within myself. I enjoyed the many quotes, poems and references planted like flowers for the soul throughout the book. I feel uplifted, enlightened and ready for a quest..."what am I more curious about than afraid of? "I will not die an unlived life.I will not live in fearof falling or catching fire.I choose to inhabit my days, to allow my living to open me,to make me less afraid,more accessible, to loosen my heart until it becomes a wing,a torch, a promise.I choose to risk my significance,to live so that which came to me as seedgoes to the next as blossom, and that which came to me as blossom,goes on as fruit.Some quotes I enjoyed:We all have islands of fear inside us, but we also all have continents of wisdom and truth. How do we find our way to them when we are not educated in the interior dimension? These inner landscapes hold the patterns of our passion and purpose. Without knowing how to journey there, our live remain unlived.Let yourself be silently drawn by the stronger pull of what you really love. ~RumiWhen I die, I want my heart and soul fully seeded with rich stories and experiences. I want t be moving forward, falling upward, leaving my body well worn. I want to know presence, staying with what is hard until it softens, staying with what is narrow until it expands. I want to know how to float in the silences between breaths and thoughts. I want to know how to lift above and sink below the flow of life, to drift and dream in t he currents of what cannot be known. It's not so much about being prepared for death as it is being full of life. I want to be so well practiced in crossing thresholds that dying is merely another step in the dance. I want to be so comfortable with stillness and silence that I can root in them.We are part of the whole which we call the universe, but it is an optical delusion or our mind that we think we are separate. This separateness is like a prison for us. Our job is to widen the circle of our compassion so we feel connected with all people and situations. ~Albert EinsteinHow could anyone ever tell you You are anything less than beautifulHow could anyone ever tell you You are less than whole?How could anyone fail to noticeThat your loving is a miracleHow deeply you're connected to my soul....how many people live with an overwhelming sense of emptiness, not because they don't have enough in their lives, but because they lack a sense of inner guidance. It is a dark time when so many of us think too small, so many are confined by their beliefs in their own inadequacy, and so many have lost faith in themselves. It's not pain in itself that's so hard on our soul, but the meaningless suffering that comes from feeling disconnected from a sense of purpose.We are not broken, we are just unfinished. ~Rachel Naomi RemenUnlimited access. I have faith that every child, every human, has a gift, specific seeds in their soul they are meant to bring to the community, and they deserve to have unlimited access to that gift. I have faith that each of us brings a unique value to the larger whole. This is my profession. If I take this on, if I give it voice and energy, every one of the days of my life will count for something. If not, every day will be wasted.What if deep inside, deeper than thought or guilt or worry, you told yourself you were a soul in wonder? How would that change the way you live your life?We cheat ourselves by identifying with a limited notion of who we are so we can fit in, belong to lives so much smaller than our own souls long for us to be.No punishment anyone might inflect on us could possibly be worse than the punishment we inflict on ourselves by conspiring in our own diminishment.While you have a thing it can be taken from you...but when you give it, no robber can take it from you. It will be yours always. ~James JoyceI wonder why it is that we so often imprison ourselves in the opinions of other people.Is the life I'm living the life that wants to live in me? ~Parker PalmerSelf-care is never a selfish act--it is simply good stewardship of the only gift I have, the gift I was put on earth to offer to others. Anytime we can listen to true self, and give it the care it requires, we do so not only for ourselves, but for the many others whose loves we touch. ~Parker Palmer...through the whole recorded history there has never been another such as you. Each of us is a miracle of uniqueness. Each of us, therefore, is responsible for the discovery of our sustaining passions and rhythms, the cultivation of the green fields in which we can discover what keeps us connected to the full fertility of our soul and all it has to give to the world.BE HERE NOW! The introductory poem is beautiful and insightful. The rest of the book is mediocre. This book belonged to an ex and I started it years ago from her place and it ended up on my shelf and I decided to finish. It's not my favorite book of this sort, but it wasn't bad. It’s full of personal material - in vignettes, so there’s little arc - and with its poetic metaphors it's excessively "feely". But the author is a bright, brimming spirit and she imparts lots of mindfulness wisdom that re-grounds the reader with presence and the importance of soul-nourishment. I'm not as impressed with this book as I was with Wayne Muller's "How, Then, Shall I Live?" Like Muller's, it's quite autobiographical, but that's basically where it stops. There are just a few questions at the end of every chapter that jar readers into engagement, rather than suggestions and exercises throughout. She writes in a circular kind of way, weaving in stories that for her signify the point she is trying to make. It's hard to get accustomed to if you like linear reading, but her metaphors are beautiful. The gems are the questions she asks the reader at the end of every chapter. Taking these questions alone and meditating, writing on them was worth the read. This is a wonderful book to use while reflecting on your own life's path. The stage of the author's life, as she tells it, will make you realize how fast time goes by and why the passion in your life needs to remain in the forefront at all times. One of the best self-help books I've read. So many nuggets of truth and wisdom that come through in the stories she tells. I am reading it again now with my partner. So thankful to Joan Borysenko for suggesting it. This is a remarkable book gifted to me by my best friend and soul-sister Alison back at the beginning of 2010. I read it and re-read it and the title often comes to mind, particularly at times of challenge. One of my favorites that I'm rereading in conjunction with the "Developing Wisdom in the 2nd Half of Life" Workshop I'm co-presenting with Kathleen Hofer this fall. Full of insightful questions for introspection, which is where I am currently. I enjoy light-reading "devotional"-type books like this once in a while. This read encourages personal renewal in the crazy technological age in which we live and offers some basic insights and some unconventional wisdom also. It was like talking to a good friend over coffee. I feel refreshed an renewed. Accidentally ran into this at the library and read it in the stacks. Um...yeah. This did not help me reclaim purpose or passion, and I read it three times. But there were a few really "ahah" moments in there for me. They say that the book finds you and so it was with this little tome- right book- right time. Just too overdramatic for my tastes. It is like Dawna Markova is talking to me as she writes. I love how she invites me into her way of living, dying and living again in her life. This is the single most depressing book I have ever read. Excruciating personal tales of hardship and loss. Could not get past the woe to get the goodies. Loved this book!!! It has inspired me in more ways than one to touch others and be positive. I want to give everyone I know a copy of this book. This book has SO many amazing insights. I love this book and would recommend every woman to read it! This is an amazing thought-provoking story that will make you question your life and the way you will live it. I would definitely read this book again, although I have read it twice now already.